Did you ever notice a deep red, spread consistency, rich flavored dish served on most Mezze platters or displays? 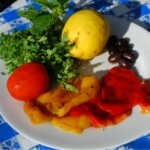 Commonly known in Israel as Turkish salad, or Matbucha, it may be Moroccan in origin and you can purchase versions of it in markets in small containers with expiration dates. Think of it as a Sephardic savory jam. Last night I decided I had an abundance of red bell peppers and tomatoes in the refrigerator. I made some and it happily simmered away while I made dinner. Making some at home although a little time consuming is infinitely better than store bought and you can consume as much as you desire. 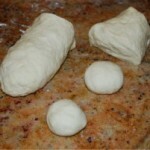 Matbucha is fantastic smeared on bread or pita, eaten plain, accompanying omelets, chicken, grilled meat, or fish. Now when summer’s bounty of tomatoes is here make some. Open the bag of bell peppers. Grasp a pepper, pull the stem end of the pepper out, and discard the stem. Pull the charred skin off the pepper. The peppers retain more of their flavor if you can remove the skin without running them under cold water. Open the pepper down one side and pull out any remaining white membranes and seeds. Lay the peppers flat on a cutting board. Dice all of the peppers with a sharp knife. 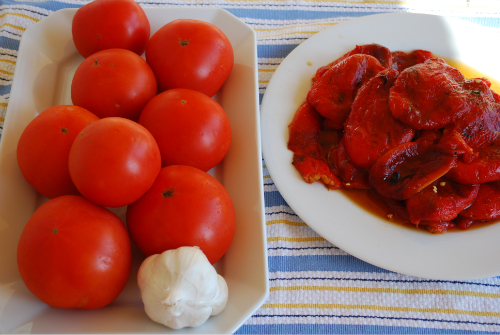 Next, peel the blanched tomatoes. 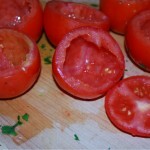 To peel a tomato, start at the X cut in the bottom and pull the skin off from the little tab that is sticking up. The skin should pull off easily. Cut the tomato in half. Scrape out any seeds, just leaving the tomato pulp. Remove the green divot where the stem attached. Dice the tomatoes to a similar size as the peppers. Mince the garlic. Preheat a large deep sauté pan. I prefer a non stick surface for this job. 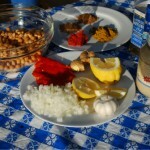 Add the olive oil then add the garlic, peppers, and tomatoes. Stir using wooden spoons. Start this on high heat and when the mix begins to bubble, turn the heat down to medium. Season with salt, coriander, and other spices. Let the tomatoes and peppers cook down, stirring occasionally. As it cooks, you may have to lower the heat to avoid sticking. 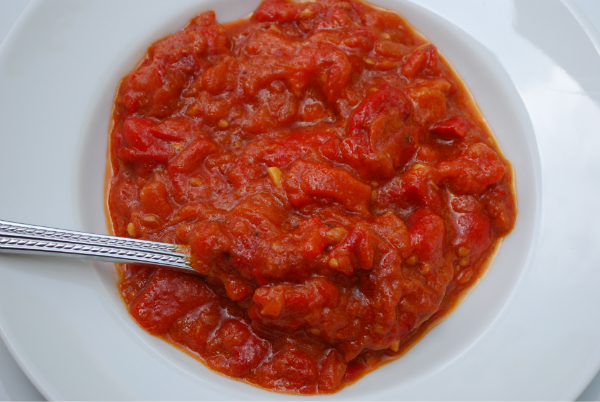 Keep cooking the peppers and tomatoes until they have reduced to a spread consistency and most of the liquid has evaporated. I noticed it took about one and one half to two hours. Let the Matbucha cool and store in the refrigerator. A non-reactive glass container is best. Serve with anything, it makes a great sandwich spread. Do you know if our Nona made this? Actually, in Israel, Turkish salad and madbucha are 2 different things. 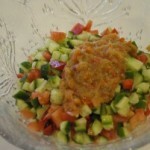 Turkish salad is mostly red pepper, onions and herbs/spices in a tomato base while madbucha is mainly tomatoes, onions and herbs/spices in a tomato base. You can add fresh hot pepper to taste.